Under Construction and beautifully nestled on a quiet wooded lot in a cul-de-sac of the new section of The Reserve at Fox Run. Gorgeous Pewee Valley and Oldham County Schools, what a Win, Win! The charming appeal of this unique 3,222 sq. 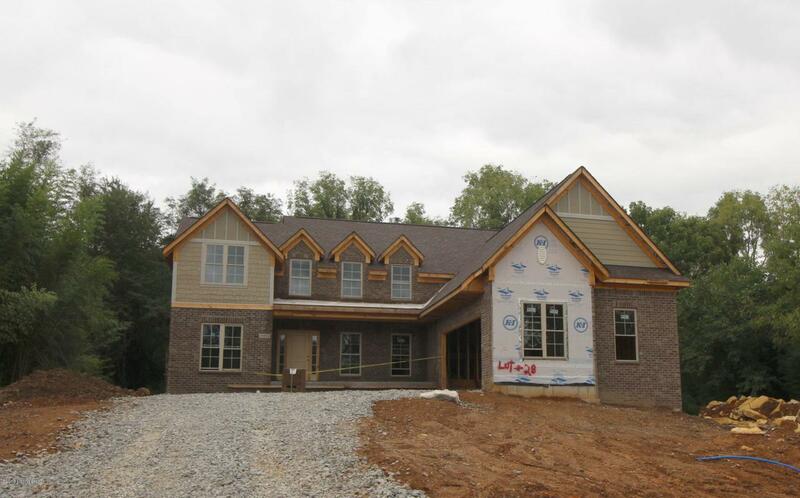 ft. brick and stone home is seen in the long covered front porch and the wooded back drop of this desirable setting. The striking entry leads you into the very open floorplan with a 2 story great room, fireplace, built-ins and a wall of windows overlooking your private wooded yard. The entire first floor has real hardwood floors, with the exception of the master bedroom. This home is being built with all of the bells and whistles already there for you. The huge kitchen has a walk-in pantry and a large dining area that opens out to another sizable coveredporch in the back. You also have the option of a spacious formal dining room. From the garage to the kitchen you'll find a mud-room, separate laundry room and a half bath. To complete the first floor is the master bedroom and bath. They are special! With a hip vault ceiling and a private view of the back woods, this generous room is one you'll love. With the master bath designed to please, there will be a split, double vanity, huge shower, large soaking tub and room size walk-in closet. On the second floor there are 3 more bedrooms, (1 with a private bath), 2 full baths and a bonus room. The drywall and finishing is about to begin, so if you wish to make some decisions and choose colors, you need to act now. You can be living in this gorgeous home for Christmas, with kids starting school in the spring! Listing provided courtesy of Ernst & Ernst Properties. © 2019 Metro Search, Inc. All rights reserved.